The deciduous witch hazel is finally blooming! Bloom will be long lasting and is more fragrant than its American cousin. Witch hazel has no known pests and can be in a container or used as a specimen in your garden. It is truly one of the first shrubs to bloom and after the bloom a small dark black fruit will bear itself on the branches. This tree/shrub can grow to twenty feet so you can tell this is just a baby and it is very slow growing. Snow is covering the ground so much here in the Princeton area that we have seen no bulbs come up at all yet. This the time to make some lists of plants that you want to focus on this spring. Are you going to bump up your natives in the garden and add perennials and grasses that work with your gardening zone? I love to reference 100 Easy to Grow Native Plants by Lorraine Johnson for ideas. It might be a time to think of plants that you have always wanted to try but have not. How about some hellebores and some tree peonies? Read garden blogs and get inspired... Perhaps read some books on some famous gardens. Great Gardens of America by Tim Richardson is on my wish list. Then think of trips you could take. How about just over the Delaware River to visit Bowman's Tower and Wildflower Preserve and see their natives, or send your garden designer to get some early this spring. The last two storms have presented lovely opportunities to cross country ski behind our home in the Gazebo Park which is preserved open space. As we have walked through the fields and outer woods of this space, we have noticed that the winter song birds have really stripped the berries from the flowering trees and shrubs. We are able to walk to Beden Brook and share some time with the blue heron that resides there. This beautiful, cherished parcel of 50 acres that abuts the Johnson property of 400 acres is a wonderful gift for Hopewellians to enjoy. It allows those of us that reside here in Hopewell Borough to live in a walkable village and have access to preserved open space shared by all. Today I am visiting my daughter's school, the Waldorf School of Princeton, and I wanted to share their new blog with you. Perhaps you are moving to the area, or are considering a Waldorf school for your child, and would like an insider's perspective on it. I got to thinking more deeply about the school after I read a recent article in the New York Times on February 1, 2010. I found that the Op-Ed piece's thoughts on overhauling our country's curriculum to focus more on how children learn and develop, vs. what we think they should know, harkened to many of the tenets of a Waldorf education. I am really grateful that my daughter is immersed in an education that develops such a love of learning and appreciation of the natural world. The school is set on 22 acres and surrounded by even more open space which is really such a gem of a spot in and around Princeton. My daughter's studies this year include an immersion in India, Persia, and Egypt, which provide inspiring links to more traditional studies. For example, a study of the Egyptian pyramids, including a field trip to the Met, lead to their focus on Geometry this year. The children work in a biodynamic garden as an outside classroom. 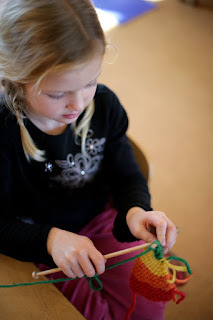 Movement is incorporated in so much of the learning that occurs during the day, and along with intricate handwork, helps develop the brain through knitting, cross stitch, woodworking and sculptural arts. Having been at The Waldorf School since she was two years old, I believe my daughter's education has helped facilitate her care for the environment and her knowledge that she is a steward to the earth, as all of our children are. If you are in the area and considering Waldorf, please get in touch as I would be happy to show you the campus. I feel really lucky to be able to walk to an edible landscaping project in Hopewell Borough that is an active part of the slow food movement in our Princeton region. Nomad Pizza makes divine wood burning pizza five nights a week with basil, salad greens, and garlic grown right here in raised beds next to the restaurant! The pizza artisans work with local farmers for cheese and go organic whenever possible. Nomad Pizza also has a vintage 1949 REO Speedwagon truck that will bring their pizza to you and your party if you wish, complete with a mobile wood burning oven or cooked on site in their Stefano Ferrara oven. The garden space has easily become a favorite place for local Hopewellians, Princetonites and all of Amwell Valley to mingle. Local artisans are showing off a lovely fountain with fish, a sculptural art piece infused with plants, and a nifty garden. I love this seasonal wreath and the lovely winter tree that was decorated along with the trellises all ablaze in white lights. The owners are as much a part of the experience as their delicious fresh pizza. After one of the owners returned from Rome, they offered the super thin pizza he found on his travels. Warm, inviting and full of charm, one feels like part of the family while dining. Tasting the terroir of Hopewell is a special gift, and they share it with us, naturally. I think it really connects my daughter to the earth and reminds her where our fruit comes from. From this personal effort to connect food to table, it grounds us all. My daughter is very lucky in that she is able to study gardening, edible landscaping, composting, some tree care and becoming a steward of her environment at The Waldorf School of Princeton. I will enjoy showing you their garden as spring approaches. Speaking of edible landscaping, I can't wait to share with you Nomad Pizza's edible landscape in Hopewell Boro.